Specialized cells in the pancreas, stomach and salivary glands produce digestive enzymes. These enzymes, along with those found in live foods, facilitate the breakdown or digestion of food, which is how the body absorbs nutrients and eventually produces energy. Taking a digestive enzyme formula can support normal digestion, nutrient absorption, overall health. 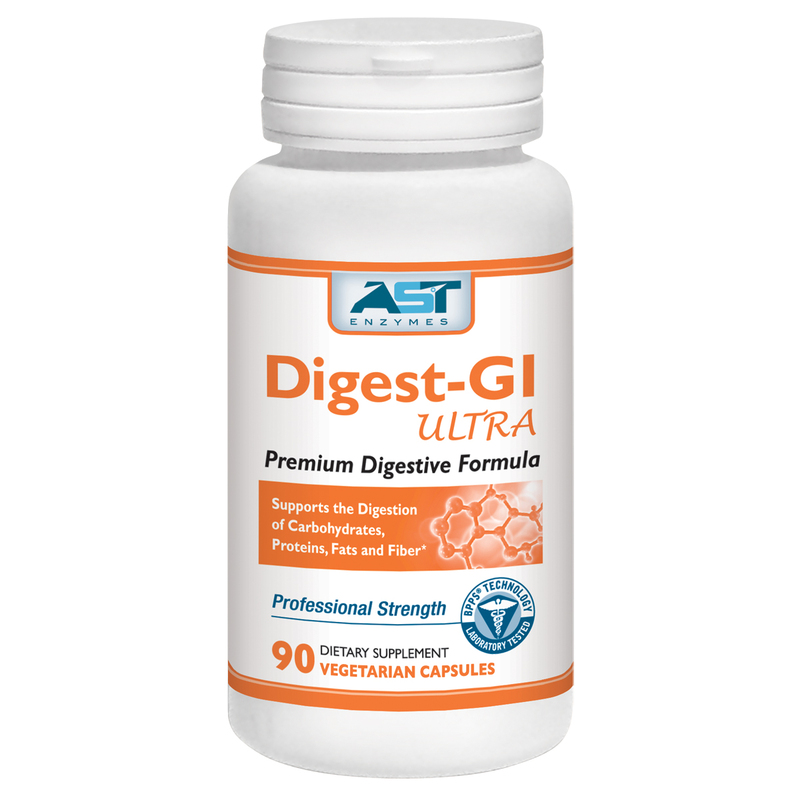 Digest-GI (DigeSEB-GI) contains all-natural digestive enzymes designed to be effective across a wide pH range throughout the entire digestive tract. When choosing a digestive enzyme supplement, it is important to know the specific benefits of the product and how it meets your needs. Each of AST Enzymes’ digestive enzyme blends are specially designed to suit a range of digestion. 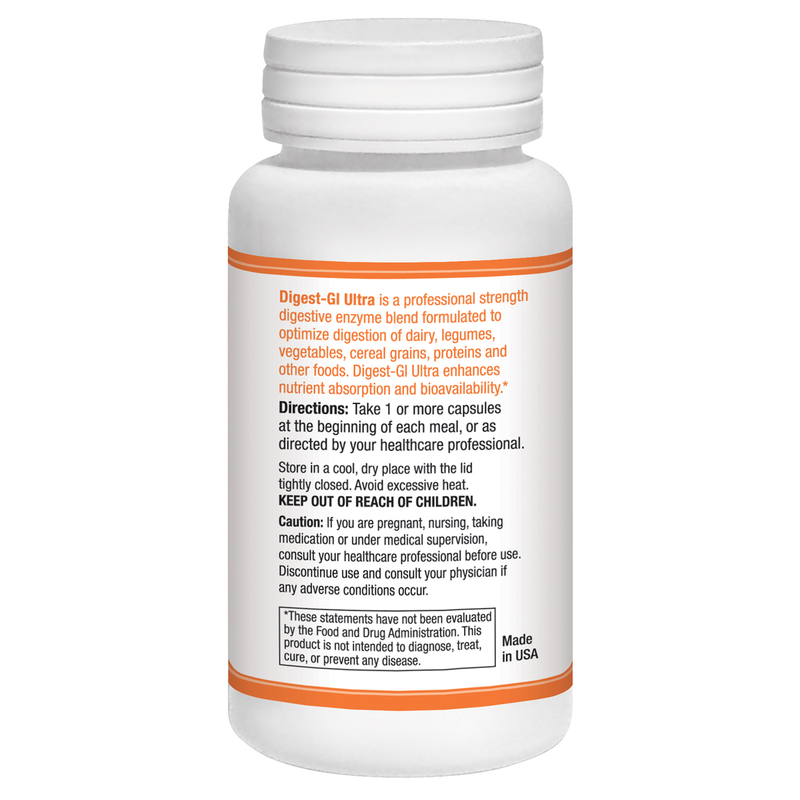 DigeSEB®-GI is an all-encompassing digestive enzyme blend. Simply put – it has the enzymes required to digest a wide range of foods. By including a variety of enzymes capable of digesting all food types, DigeSEB-GI is very versatile and can be taken with any meal to aid in the digestive process. Gluten Relief® is specially formulated to assist with the digestion of gluten-rich foods. Products typically characterized by their gluten content such as breads and pasta are also carbohydrate heavy as well. To address this, additional carbohydrate-digesting enzymes are included in Gluten Relief to compliment the powerful DPP-IV activity. Lacto-Relief includes a high concentration of lactase, and supports proper dairy and milk product digestion. What is digestive enzyme therapy? Digestive enzyme therapy is the use of plant or animal-based dietary supplements to aid in digestion and promote balanced metabolism. * They enzymes in this blend are 100% vegetarian/vegan. The body produces digestive enzymes. Factors ranging from age to stress to lifestyle choices affect enzyme production. What is a digestive proteolytic enzyme? Proteolytic enzymes break down proteins into their building-blocks, which are called amino acids. The body requires 20 different amino acids, 8 of which are referred to as essential amino acids because they cannot be synthesized by the human body. These essential amino acids must be obtained from the food we eat. Without sufficient proteolytic enzymes, the body is unable to break down and absorb these necessary nutrients. How long should I take Digest-GI before feeling results? Depending on these variables, along with one’s individual response to digestive enzyme therapy, the dose can be as high as 4-5 capsules per meal. It is advisable to experiment with dosage, considering there is no upper limit or adverse effects in exceeding your supplement needs. Digestive enzymes aid in digestion of food. It is recommended you take digestive enzymes prior to a meal, but if you miss a dose, we recommend you take them directly after your meal. Why is it important to take Digest-GI with food? 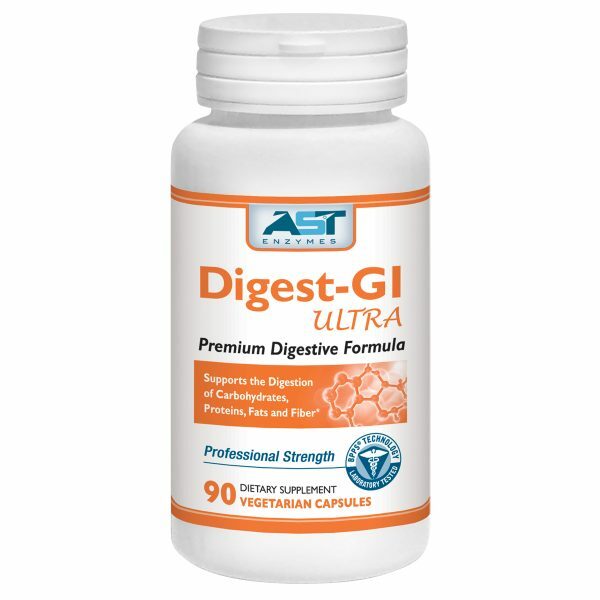 Since Digest-GI (DigeSEB-GI) aids in overall digestion, it is contraindicated to use the enzyme without eating. Although it is not harmful to take DigeSEB on an empty stomach, it is simply a waste of money. If you take digestive enzymes too soon before a meal, you risk the enzyme becoming inactive. The food and enzyme must be in the stomach together for proper results. Are there any side effects involved with Digest-GI? Side effects with Digest-GI (DigeSEB-GI) are rare. Mild cramping, bloating or gas may occur. Starting off at a low dose can minimize any possible side effects. Side effects should clear with regular use, after a tolerance is established. What does “proprietary blend” mean? Proprietary refers to a patent, or ownership. Applying this concept to our digestive enzyme blend, it means that we alone own the rights to the specific blend of enzymes found in DigeSEB-GI, making our product different from similarly marketed digestive enzyme supplements. 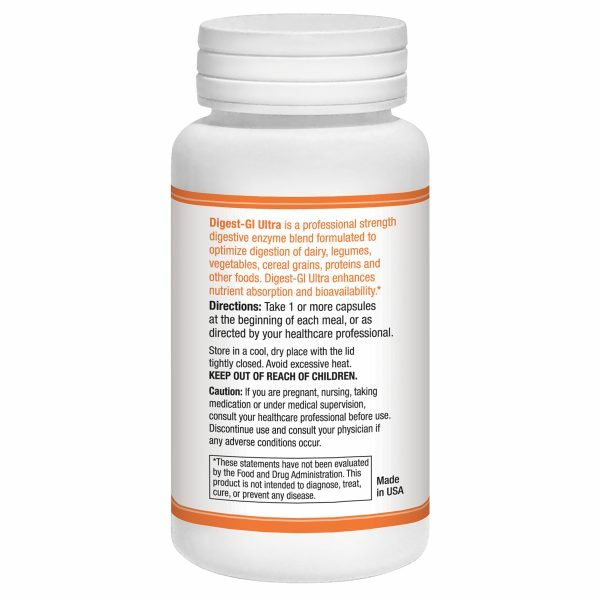 DigeSEB-GI encompasses an all-inclusive digestive aid product that assists in the digestion of several nutrients, not just beans and vegetables. Can I take Digest-GI with other systemic or digestive enzymes? Although digestive and systemic enzymes are not contraindicated in terms of ingredients, they should not be taken at the same time. The purpose of digestive enzymes is to aid in digestion of specific foods, so taking them with food is an obvious recommendation. Because systemic enzymes require an empty stomach for maximum absorption, they must be taken separately from digestive enzymes. There are no adverse interactions between systemic and digestive enzymes, but they serve different purposes, and thus should be taken as directed for best results. Can I open the capsule and pour it onto my food instead of swallowing the capsule? If you find that you have trouble swallowing the capsules, pouring its contents onto food is definitely an option. You may also open the capsule into a glass of water, being sure to drink the entire glass. If you choose to take the enzymes this way, it is best to consume the entire content as soon as possible to ensure you are receiving the full benefits within your body (rather than on your plate). Since i started taking this enzyme I’ve had no bloating , gas, cramps Or discomfort after meals , wish I knew about this years ago ! I use this product daily with all meals and snacks. I don’t have all of my pancreas so digestion is difficult. 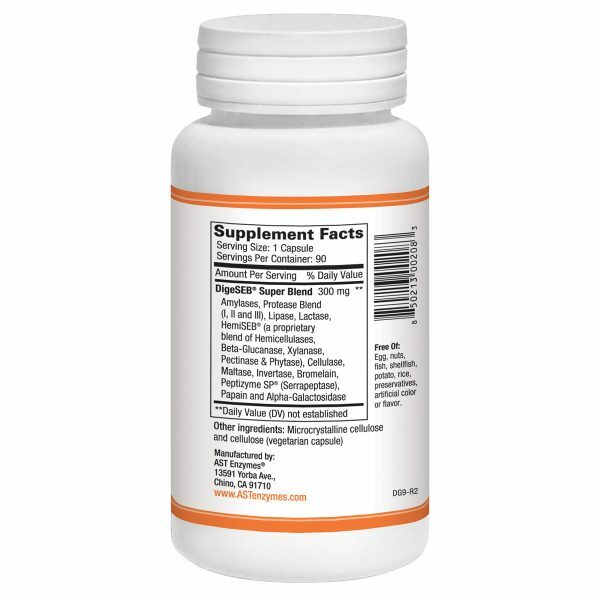 I added this particular supplement that I use along with Lipase-HP Plus and Lacto-Relief. I am able to eat and the diarrhea I had is about 75% less which is significant! I will not be without Digest-GI which I have found has improved my overall general health and wellbeing through much improved digestion. It has also allowed me to live a normal life free from the embarrassing side effects of digestions issues. AST Enzymes …. thank you very much! Best on market-tested and true! All AST products have been successful and helpful for family and clients! These enzymes have been life changing for me! I can eat salads and other foods again with no painful reprecussions! I can’t thank you enough!!!!! gently and without ill affects. We make sure that we keep a bottle on hand. This is my go-to enzyme for any meal. My digestion has improved immensely! I LOVE Floracor-GI. For me it is an amazing digestive aid. The only time in my entire life that I didn’t bloat after eating was when I was taking Floracor-GI. I highly recommend them! Highly recommend this digestive enzyme product. Gut health is critically important and this enzyme is a powerful aid in that. The chronic bloating that I was experiencing disappeared with the use of this supplement. I also have more energy and a greater sense of well being. Thanks AST for this excellent product.